Carbon Dioxide (CO2) is a colorless, odorless gas consisting of molecules made up of two oxygen atoms and one carbon atom. The CO2 molecule is involved in a complex series of processes called the carbon cycle, where the carbon atom within the molecule moves between many different natural reservoirs. Carbon dioxide (CO2) is emitted in a number of ways. 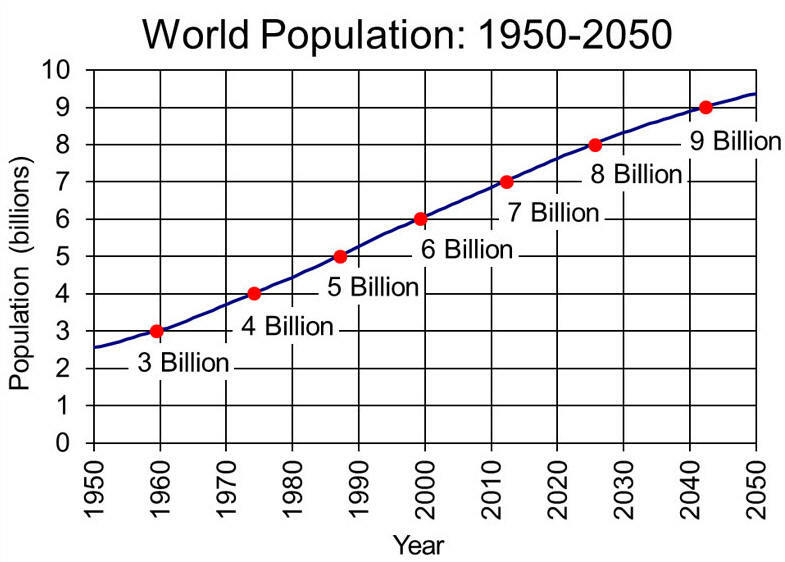 It is emitted naturally through the carbon cycle and through human activities like the burning of fossil fuels. 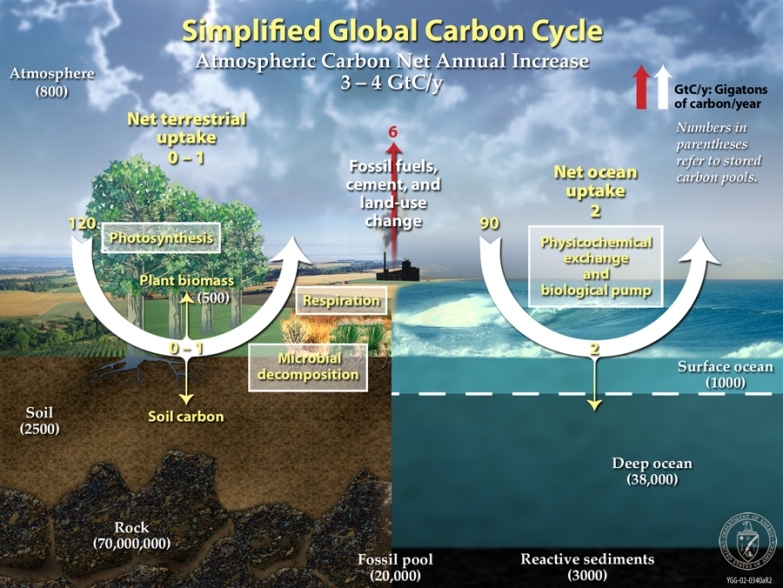 Natural sources of CO2 occur within the carbon cycle where billions of tons of atmospheric CO2 are removed from the atmosphere by oceans and growing plants, also known as ‘sinks,’ and are emitted back into the atmosphere annually through natural processes also known as ‘sources.’ When in balance, the total carbon dioxide emissions and removals from the entire carbon cycle are roughly equal. 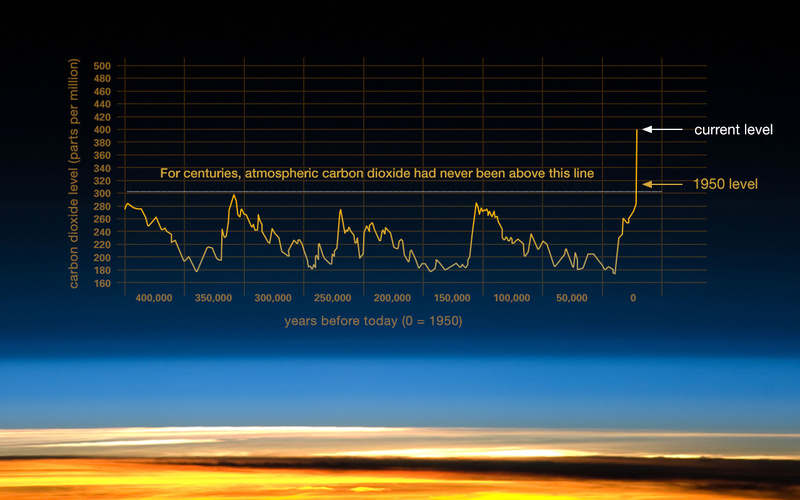 The graph shows recent monthly mean carbon dioxide measured at Mauna Loa Observatory, Hawaii. 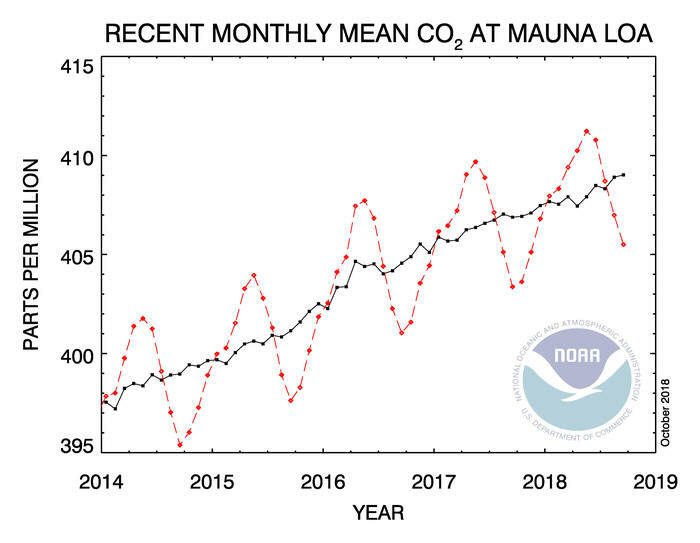 The last four complete years of the Mauna Loa CO2 record plus the current year are shown. Data are reported as a dry air mole fraction defined as the number of molecules of carbon dioxide divided by the number of all molecules in air, including CO2 itself, after water vapor has been removed. The mole fraction is expressed as parts per million (ppm). Example: 0.000400 is expressed as 400 ppm. In the above figure, the dashed red line with diamond symbols represents the monthly mean values, centered on the middle of each month. The black line with the square symbols represents the same, after correction for the average seasonal cycle. The latter is determined as a moving average of SEVEN adjacent seasonal cycles centered on the month to be corrected, except for the first and last THREE and one-half years of the record, where the seasonal cycle has been averaged over the first and last SEVEN years, respectively.